(Newser) – Last week, Australian officials said someone had plotted an Indian Ocean course on the flight simulator belonging to the pilot of missing Malaysian Airlines Flight 370. This week, a renowned air-crash expert adds onto that, saying he believes the jet was deliberately brought down into the water, the BBC reports. Larry Vance, who once headed up Canada's Transportation Safety Board, appeared on the Aussie program 60 Minutes and said that "definite evidence" suggests a controlled landing, not an autopilot crash that would've left plenty of floating debris, per the Guardian. "Somebody was flying the airplane into the water," he said on the program. "There is no other alternate theory that you can follow." 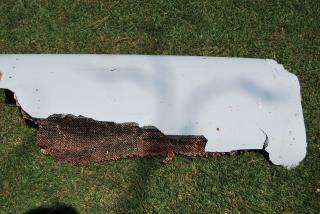 He also thinks "the fuselage is intact for the most part, and is on the bottom of the Indian Ocean," per the Telegraph. The lack of debris proved this two years ago. 300 seat cushions would be floating up all over the place. In spite of this obvious fact, it was ignored as was his test flight on simulator to same area. As a result, the plane glided over a hundred miles from power down at 8:19 and the search was taken in the wrong place. What a waste of time and money. Hopefully someone will look in the right place but unlikely as 140 million was flushed down the toilet. What the heck is a flaperon? So the crash could have been a scullenburger thing? So Captain Nemo has them as guests then? It is guest or guests English Lovers out here, I hate English. As 'I had 2 guests (2 guest?) over. And I told Katy and Taylor here is a song I wrote called 'with not much on'. Yes it sounds in frame sort of as Nights in White Satin but only better'?